Japanese men scramble for lucky sticks Jump to media player Thousands of men seeking luck have tussled to find two sacred sticks as part of an ancient Japanese festival. Russian ritual of jumping in ice water Jump to media player The ancient ritual, which commemorates the baptism of Jesus Christ, involves worshippers jumping into barrels of water that are first blessed by priests. The lucky iron fish Jump to media player A fish-shaped lump of iron could be the answer to the global problem of anaemia. 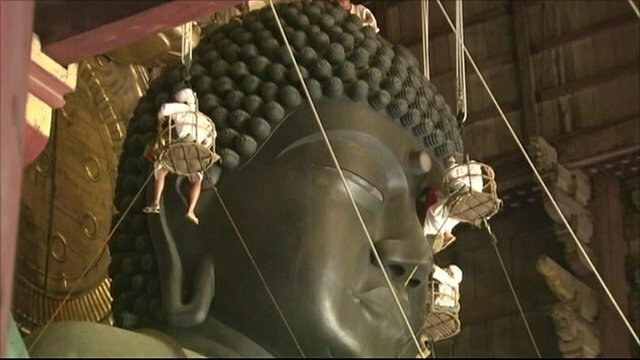 Great Buddha's ritual cleaning Jump to media player Buddhist monks have held their mid-summer ritual cleaning of the Great Buddha statue at Todaiji Temple in Japan. Thousands of near-naked men seeking luck have scrambled to find two sacred sticks as part of an ancient Japanese festival. It's thought about 10,000 men wearing white loincloths took part in the ceremony at the Kinryozan Saidaiji Buddhist temple in Okayama on Saturday.